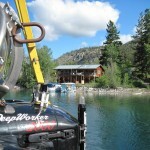 On the way back from Kelly Lake, we swung by Pavilion Lake to take some shots of the live sub operations underway. This is a very beautiful part of the world. Next year the team will be diving into a lake called Kelly Lake, and potentially Pavilion Lake at the same time. This creates a challenge for the communications team. Both sites must have broadband access to the Space Network Research Federation (SNRF) and the Internet, and be able to communicate from site to site at all times. 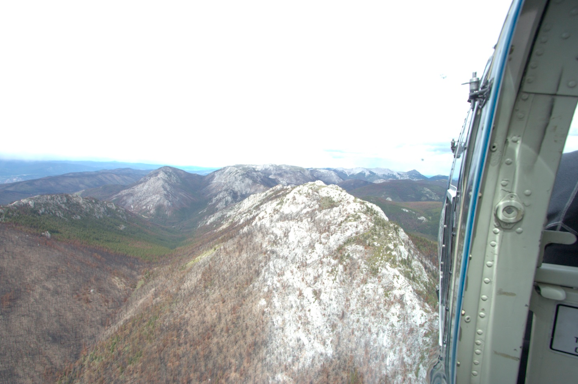 Satellite connectivity is great, but in this environment the “terrain mask” (steep rise of the terrain all around us) makes it difficult to hit a satcom “bird” in the sky from these high northern latitudes. On top of this, satellite transponder time can be expensive (especially considering the amount of “megahertz” or transponder we need! ), and adds a significant “latency” to the communications link (in both directions) because the satellites are orbiting so far above the Earth. This latency can cause problems for some of the operations conducted by this team, and terrestrial interfaces tend to have very low latency. 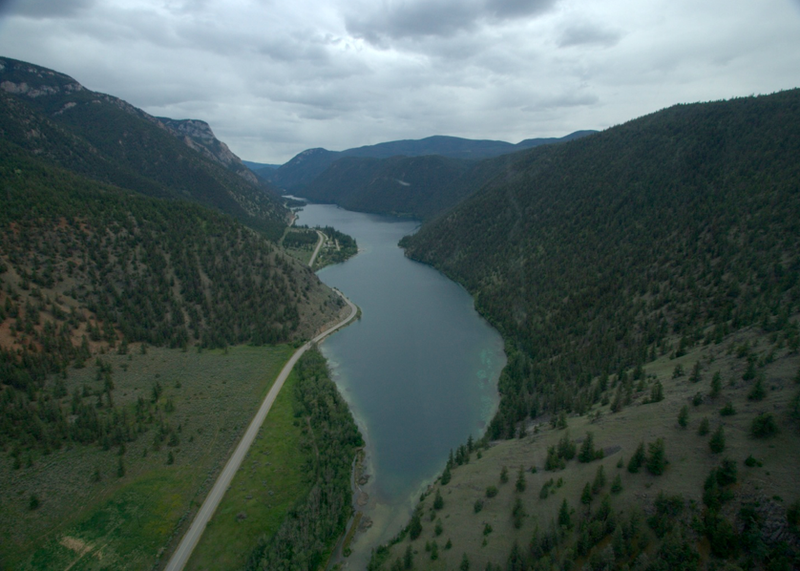 So we took off in a helicopter in Lillooet, and flew to Kelly Lake to visit and survey the terrestrial (ground/mountain-based) communications options for communications near the lake. If we can avoid using a satcom link, we’ll have greater bandwidth and network performance at the 2011 test operations. One of the DeepWorker chase boats, looking south. The PLRP 2010 field season has come to a close and I am both saddened by the fact that operations are finished for another year but excited by the prospect of adding the data we’ve collected this year to our growing body of knowledge about this unique lake. I am in awe of the work that has been done by this amazing team and of how much we’ve grown, while maintaining the sense of adventure and camaraderie that to me, helps to define the PLRP. We’ve taken great strides towards answering many of our research questions and in the process, with every answer we have come up with many more questions that will keep the PLRP team occupied for quite some time. Fortunately, our family continues to grow and every year we welcome new individuals who bring a unique perspective and desire to tease out the mysteries Pavilion has to offer. We have also been blessed this year by the addition of two little members to the PLRP family, Darlene Lim’s daughter Amelia and Greg Slater’s son Joseph. We look forward to the day when they are exploring the lake alongside us. 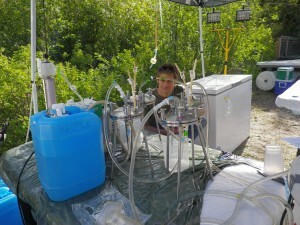 The PLRP provides a wealth of research opportunities, and not just those focused on understanding the processes leading to the formation of the structures at Pavilion Lake but also to understanding fundamental biological, chemical and physical processes. The research contributions from our participating scientists and graduate students have resulted in a number of recent publications and are essential to increasing our understanding of Earth and astrobiological systems. We’re very proud of the role that the PLRP has played in developing operational technologies and protocols that not only help us meet our science objectives but provide important input into future space science missions. With the addition of our two newest scientist pilots, astronauts Chris Hadfield and Stan Love, we had 34 DeepWorker missions over 10 days of operations. This year we were aided greatly in our pre-season flight planning by the wonderful team from NASA Ames led by Matt Deans and David Lees who developed an amazing flight planning tool that enabled us to search images and flight paths from previous years while building flight plans in Google Earth. Flights this year were planned to collect images of the remaining unexplored regions of the lake, to record detailed images of areas of interest identified from 2008 and 2009 data and to use the submersibles in combination with other analytical tools such as a conductivity, temperature and depth (CTD) instrument and our autonomous underwater vehicle(s) (AUV). Our ability to review post-flight video data in the field, an effort pioneered in 2009, added greatly to our productivity as this information was used immediately by the science backroom team to modify existing flight plans to best optimize our data collection. As part of the daily flight debriefs, we have also continued to apply metrics associated with scientific productivity to understand factors that influence scientific exploration. New this year to the DeepWorker flight repertoire were long ~ 5 hour flights and two night flights to investigate the grazing activity that we suspect may occur in the lake. To add to the innovations this year, Nick Wilkinson designed a fantastic, interactive program for use in classifying the microbialite images. This new tool will allow us to efficiently organize and process our field data over the coming months. Stay tuned for updates. 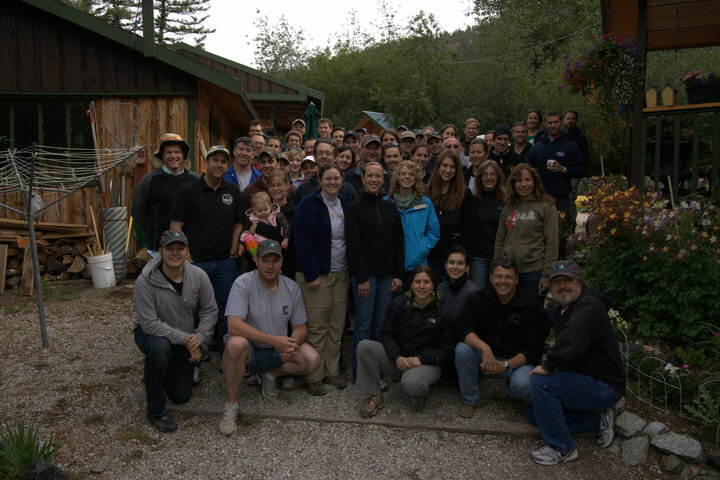 The Amazing Pavilion Lake Research Project Team: 2010! In case our DeepWorker operations didn’t keep us busy enough, we had a number of other important activities included in the field schedule this year. The UBC and University of Delaware AUV teams produced fantastic images of the lake bottom that were often used to compliment the DeepWorker flights and give us a better picture of where interesting structures and features are in the lake. Numerous SCUBA dives were performed by our intrepid team of divers to collect water and microbialite samples that were shared between various research groups in an effort to combine and compliment analytical findings. These samples will be characterized from a virology, microbial lipid, isotopic and genetic point of view to provide more information about the role of biology in the formation of the microbialites and what biosignatures may be left behind. Water samples were collected from nearby lakes including Crown, Turquoise, Pear and Kelly Lake to continue to help us put Pavilion Lake in context. 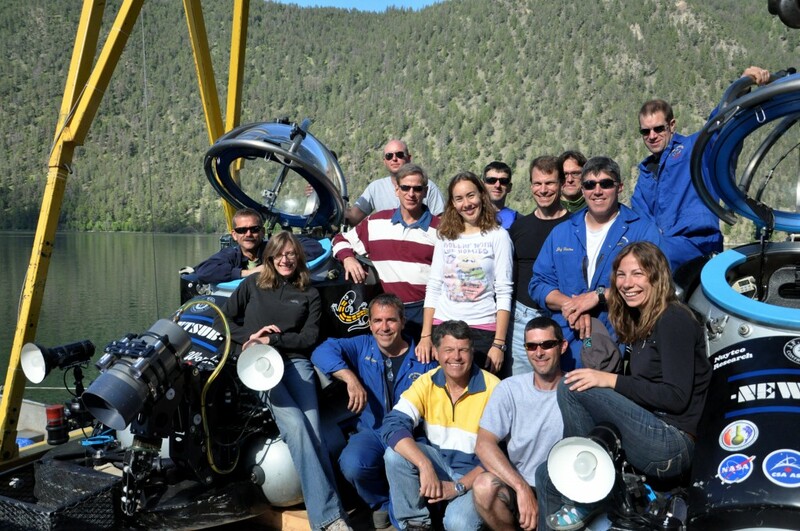 Kelly Lake, which also hosts microbialites and has been an area of interest to the PLRP team for many years, was also the focus of significant AUV activities this year. Microbial mats were once again collected from the Cariboo Plateau lakes and giant pancakes were eaten by all (well, almost all). As a new participatory activity this year, our visiting teacherswere given the task of selecting a SCUBA dive based on their understanding of the research questions of interest (on their first day no less!). I’m happy to report that they eagerly interviewed members of the team before presenting their selected dive and rationale to the group for inclusion in the next day’s diving schedule. Community Day was another great success this year with the team happy to show off our work and answer questions from the many visitors we had to the site. Busy indeed! We plan on continuing our updates throughout the year as we analyze samples and work through the amazing amount of data that were collected. Thanks to all who have read about our activities and through this process, have joined in our adventure. See you next year! HMP-2010: Nearing Peak in HMP Camp Activity – Daily Updates Commence! Two twin otter flights came in today with 10 participants total, including the K10 robot team lead by Dr. Matt Deans, supported by Dr Trey Smith, Dr Hans Utz, Susan Lee, Vinh To and Eric Park (all from NASA Ames), and Byron Adams and Kelsey Young (both from the Geology Dept. at Arizona State University). On the second flight was Peter Ikaluk from Resolute Bay and [yours truly] Elaine Walker (E/PO, Mars Institute). The K10 robot team will be following up on work done during the 2009 field season by Dr Pascal Lee (Director, HMP / NASA Ames, Mars Institute, SETI Institute), Dr Mark Helper (Distinguished Senior Lecturer, University of Texas at Austin) and Dr Essam Heggy (Planetary Scientist, JPL). Last season they completed simulated lunar geological and geophysical traverses as part of their studies of robotic follow-up to human exploration, and of the efficiencies of pressured rover and EVA exploration. Peter and Elaine’s flight landed at HumVee Beach where the Moon-1 Humvee Rover and supporting vehicles are parked. Elaine took pictures and video of the site while Peter and the two Ken Borek pilots loaded all four of the Humvee tracks onto the twin otter. They are quite heavy. John Schutt (HMP camp manager) gave the new arrivals a tour of the HMP base camp and safety briefings, then lead the evening meeting in the mess tent. Jeff Fagen is our new camp cook. Jeff is from Vanouver, and so far he is a big hit. His food is excellent as well. He and John Schutt have additional support from Nathan Kalluk, Star Amurulak and Peter Ikaluk from Resolute Bay, and Terry Pijimini and Ben Audlaluk from Grise Fiord. There are several research projects going on simultaneously including the ongoing Arthur Clarke Mars Greenhouse effort lead by Matt Bamsey (CSA), a space biology study led by Dr’s Robert Ferl and Anna-Lisa Paul (Univ. of Florida), the K10 robot team led by Dr Matt Deans, research on the immune system by Dr Valerie Myers from NASA JSC, as well as geology research by Dr. Pascal Lee and Kelsey Young, as part of her PhD thesis at ASU. Pascal and Kelsey hope to gain further understanding in the glacial evolution and geologic history of the Haughton impact structure, date the crater more accurately, and to learn more about the makeup and size of the impactor itself, using the geochemical trace that it left behind. It was 6 celsius today with light rain. The mood is very high at camp and we look forward to a great season as we near the peak in camp population. Please stay tuned for photos. Author NASA Testing for Human Space ExplorationPosted on July 20, 2010 Categories UncategorizedTags Analogs, field test, field testing, General, Haughton Mars Project (HMP), Pavilion Lake Research Project (PLRP)1 Comment on HMP-2010: Nearing Peak in HMP Camp Activity – Daily Updates Commence! DORA and UBC-Gavia in the water ready to deploy in Pavilion Lake. Its now been just over a week since the end of our adventures at Pavilion Lake and, as I start trying to look at all the data we’ve collected, I can’t help but be impressed with our successes. In addition to the image mosaicing that I was working on, and showed pictures of in an earlier post, my specific focus of being up at the lake was running coordinated missions between the two autonomous underwater vehicles (AUVs), that we had on-site from the University of British Columbia and the University of Delaware, and the Deepworker vehicles. Our mission planning goals were twofold; joint objectives and joint missions. Joint objective style missions measure parameters that are relatively static in time (i.e. photos of microbialites). This means that coordinating different platforms isn’t necessary but coordinating their datasets are. This requires that the timestamps of each data stream be precisely set and that the dataset is georeferenced to a high degree of accuracy. This work was started last year but continued this year by using the collected images from Deepworker and comparing it with AUV collected data (e.g. high-precision bathymetry). 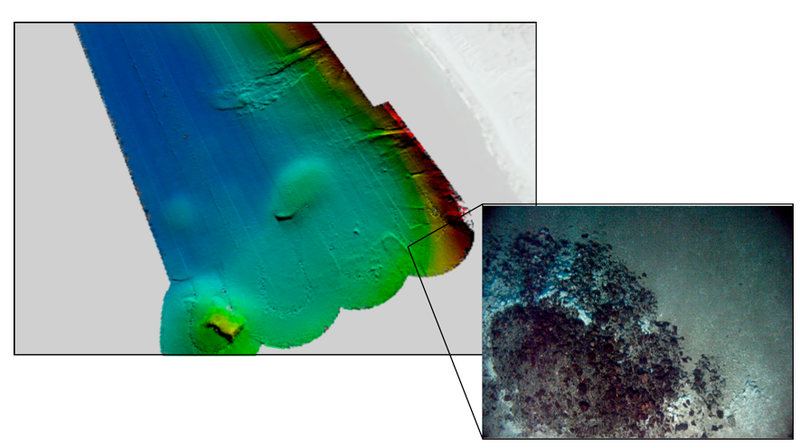 Comparing multibeam bathymetry collected with DORA with detailed imagery from UBC-Gavia. Joint missions involved a significantly greater degree of coordination as it involved running the vehicles at the same time as the Deepworkers. Our experiment this year was to look at the area of increased salinity at the bottom of the lake. 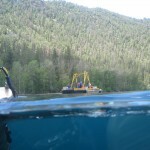 To this end had the Deepworkers crossing the bottom of the basin at about 1 m from the bottom (> 55 m depth), while running UBC-Gavia at 40 m depth. The greatest debate was trying to decide what the minimum safe distance was to be between the two platforms! In the end we ran AUV missions down to 48 m without any problems. Although we’re just starting to process all of this data now, from both styles of missions, we’re excited about what new perspectives these combined datasets might hold. We’re up at 7, skipping breakfast and congregating down at the dock to find our rubber boots and tie the canoe onto the roof of our rented SUV. Over an hour of mental exertion later (remembering forgotten equipment and forgotten knots), the spotless yellow canoe is lashed onto the too-small roof rack and we’re ready to go. Our mission today is deceptively simple: collect slimy mud from three small lakes on the Cariboo Plateau (yep, that’s how you spell it), about an hour and half north of the Pavilion Lake research station. Though it sounds simple, before we’re finished we’ll face rocky off-road drives, deep sucking quicksand-like mud, and flocks of hungry mosquitoes. However, our first challenge comes less than an hour into the drive, in the cozy town of Clinton, and it comes in an unlikely form: pancakes. These aren’t just any pancakes, these are PANCAKES. Hungry-researcher sized pancakes — the size of a large microbialite. The pancakes here are a PLRP tradition, and I’m proud to say that our little group vanquished these planetary-scale hotcakes with hardly a hiccup. I must however admit that the four of us — Allyson (PLRP Acting PI), Jen (McMaster student), Henry, and myself (McMaster postdoc) — had a little help, in the form of 2-dimensional likenesses of Darlene (PLRP PI) and Greg (McMaster PI), who provided essential moral support in our endeavor. After fueling up on carbohydrates and coffee, it’s time to find our lakes. We have GPS coordinates from previous visits, but in the end it comes down to brain power and hazy recollections when tracking down these mysterious bodies of briny water. “We’re looking for two cement blocks…. no, the road doesn’t have a name” was a typical direction on our course. We arrive at the unofficially-titled Probe Lake and haul the canoe down to the shoreline, which is black with flies feasting on the remains of millions upon millions of desiccated larvae. I take a step into the reeking muck, en route to the brownish-green mats beyond, and am warned, as the mud approaches the top of my rubber boot, that “it’s deeper than it looks.” Thankfully I don’t have to wade too far through the mud because of a brilliant tool built by Allyson, consisting of half a plastic bottle taped to the end of a long pipe. Holes drilled through the bottom allow water to pass through while collecting the firm mats. Using this instrument I collected several jars of mats to return to McMaster University, where I will analyze the diversity of microorganisms in the mats and link this to biosignatures like fatty acids. Meanwhile, Jen and Allyson have launched the canoe and are taking water samples from the middle of the small lake. Previous research has found that these lakes are very salty and highly alkaline, or basic: they have a pH of about 10.1. The high pH is caused by very high concentrations of carbonate in the water. Watch a tutorial on carbonate chemistry at the PLRP website. One reason we are interested in these strange lakes is that although they are rich in carbonate ions, the microbial communities do not precipitate the carbonates and form microbialite structures as in Pavilion Lake. Understanding these differences may help to explain why the Pavilion Lake microbialites are so unique. These lakes may also be modern-day analogs to briny pools that existed early in Earth’s history, perhaps even before the rise of oxygen. Biomarkers are chemical compounds created by microbes that can be preserved over geological time scales in rocks. 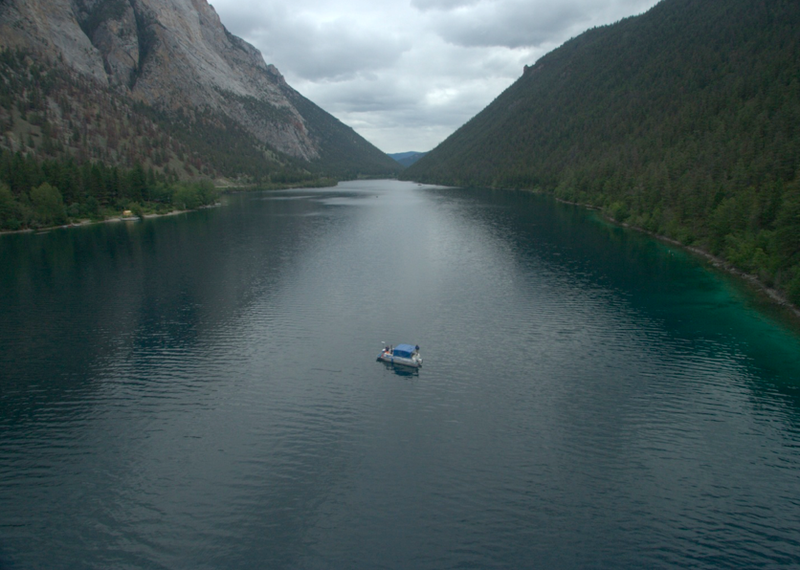 By identifying the microbial community members and their biomarkers in these lakes we may aid in identifying members of ancient microbial communities that are today preserved only as biomarkers in rocks. After sampling each of the two remaining lakes I am more and more amazed by how different each lake is from the others, despite their similar origins and general chemical makeup. For example, the water in Probe Lake and Deer Lake is crystal clear, while Goodenough lake is so full of opaque particulates and brine shrimp larvae that we can’t see the bottom, less than 50 cm below us. The mats in each lake are also starkly different, ranging from pale pinkish flocculent islands to drier dark mats with thick bread pudding consistency, to mats with sharply delineated horizons of purple and green photosynthetic bacteria. I’m excited to find out how the diversity of the microbial community is different in each lake and what role the lake chemistry might play in structuring these complex, colorful, and infinitely intriguing analogs for life on the early Earth. I’m less excited about washing out the canoe and the car, both of which are caked with stinking black mud, but sometimes that’s just what it takes to be an astrobiologist, and it’s all worth it in the end. We are back at the Pavilion Lake Research Project this summer. It is great to return to the lake and rejoin the team. Our first night there, we were given homework. Usually we are the ones assigning homework, but this time it was different. Our task was to select a dive that we thought would help the team with their research and justify why this dive was, in fact, important to the team. We had a list of six dives that would all help the project, but we had to narrow it down to just one. As we started to interview and ask the scientists questions, it was clear that this would not be an easy task. The people that we talked to all had different reasons why each one was important. 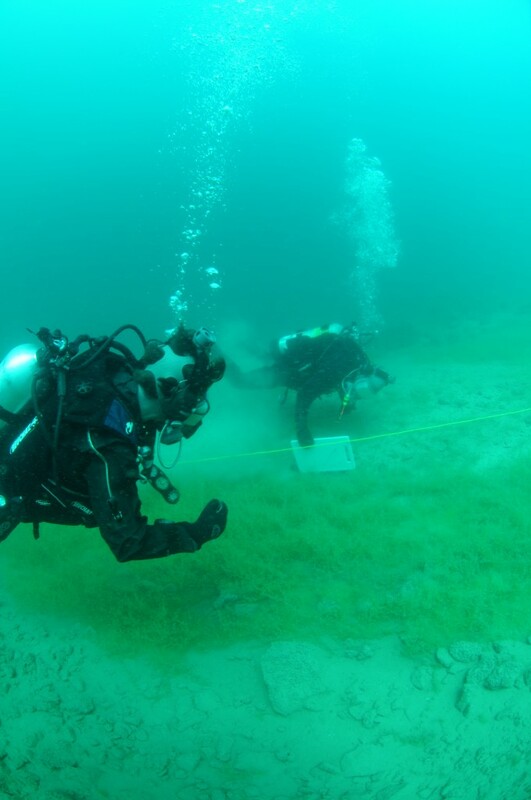 In the end, we selected one where the divers would measure the angle of the slope using an underwater inclinometer along a transect to see if the slope influences the morphology of the microbialites. The next morning, our dive was executed and we were on the boat to see our dive happen. We recorded the data – the depth, the angle and the sediment – as the divers used a scubaphone to communicate with us while they were underwater. This was very cool science and something we are excited to share with our students as they use inclinometers at school as well. Divers use an underwater inclinometer to measure slope angle on our selected dive. Our role at Pavilion Lake is to learn about the science that is happening at the lake and how we can teach about that back in the classroom with our students. Another task that filled our time was gathering resources and ideas for our lesson and activity ideas. We had a chance to interview, in video format, many of the people that are here studying the lake. We had some great interviews and learned in the process. Thank you to all those scientists who took time out of their busy day to let us interview them. As teachers, our summer vacation is just beginning. However, because of our experiences here at Pavilion, we are already looking forward to going back to school in September to share our time at the lake with our students through stories and science activities. Editor’s Note: Jen Stonehouse, Bree Mireau and Leanne Shortridge are teachers in the Greater Vancouver Area. With two more “flights” in the Deepworker submarine under my belt since last I wrote, I’ve gotten a lot more familiar with the machine. 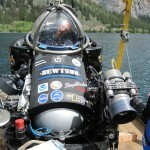 Although the miniature submarine looks nothing like a space suit, there are a lot of similarities. And someday, when humans visit near-Earth asteroids or other objects with very low surface gravity, I expect they’ll do their spacewalks in something that looks a lot more like a Deepworker than a traditional person-shaped space suit. Here’s why. A small asteroid has such weak gravity that even the slightest nudge with a hand or foot would send a spacewalking astronaut soaring high above the surface, and it might take hours to come back down. A stronger shove might send an astronaut away at a speed higher than the escape velocity, in which case gravity would not bring them back ever! Not so good. On the International Space Station, which of course has no noticeable gravity of its own, astronauts keep from floating away by holding on to special handrails. Asteroid do not come equipped with handrails. They do have rough surfaces which might provide hand- and foot-holds, but unfortunately most asteroids are not solid blocks of material. Instead they are “rubble piles,” flying clumps of sand, gravel, and boulders held together not by material strength, but by their own weak self-gravity. So if you were moving hand-over-hand across the surface of the asteroid and accidentally pushed yourself off on a suborbital trajectory, you could grab onto a rock to keep yourself down–and the rock would simply come away with you! The practical result is that hands and feet are probably not the best way to move around an asteroid. Better might be a suit with tiny thrusters that you could use to maneuver yourself around the landscape. But if you’re not using your hands and feet to move around like a person climbing a tree, there’s no need to enclose them in a flexible suit. Instead, you could keep them inside a hard pressure shell where they could be used to control thrusters, manipulators, and onboard systems. Such an arrangement might look a lot like a Deepworker. As a side benefit, the operator might be a bit more comfortable than in a traditional space suit. Our underwater work here at Pavilion Lake ends this afternoon. I’ll be the pilot for one of the last two “flights.” The flight planner, Dr. “Mars” Marinova (who was just recently awarded her Ph.D. from the Geological and Planetary Sciences division at Caltech, where I worked as a postdoc more years ago than I care to admit), set up an especially interesting flight plan for me. I’ll visit one of the “deep mounds,” outcroppings of microbialites growing on isolated boulders on the otherwise rather flat and monotonous central floor of the lake. Then I’ll head off to do some vertical transects along the western shore. These transects begin in deep water, then move upslope through the depth zone where the microbialite population is richest. As I fly the transects I’ll record video of what I see from the submarine, and keep a running monologue (also recorded on board) of my observations. 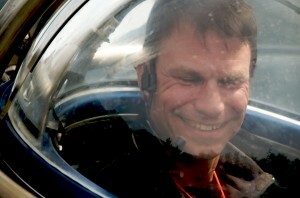 It should be a lot of fun…and I’m sure I’ll miss piloting the submarines when the field season ends. 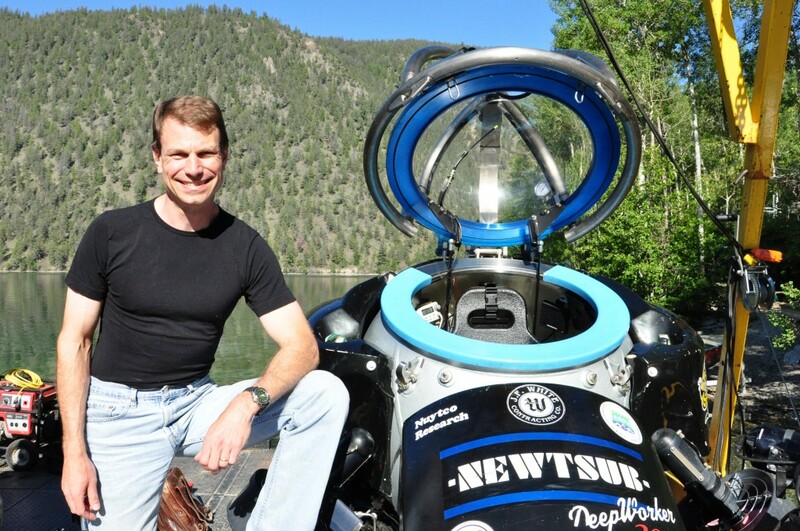 This wraps up Dr. Love’s Underwater Blog. If I’m fortunate enough to be able to participate here next field season and spend more quality time underwater, I’ll be sure to reactivate the blog. Pavilion Lake and Beyond: How to Effectively Explore Other Worlds? 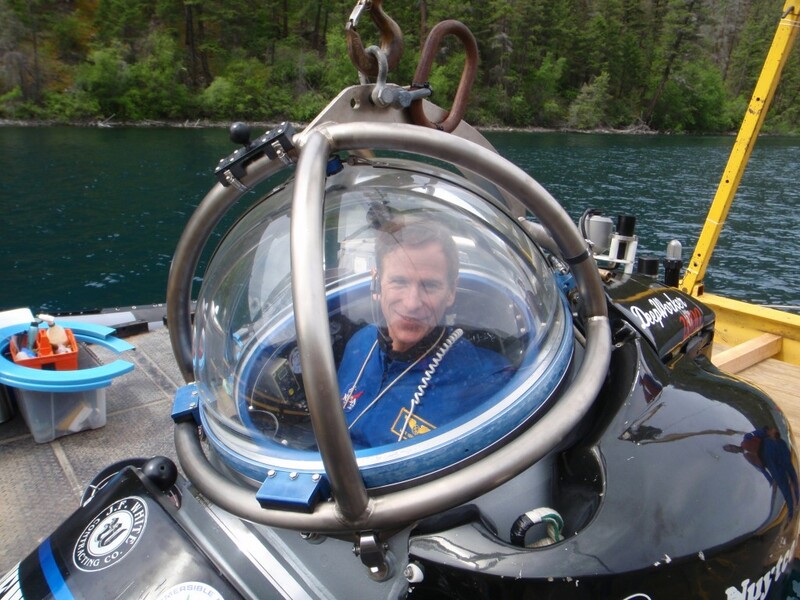 This is my third year as a submarine pilot/scientist on the Pavilion Lake Research Project (PLRP) and it is really exciting and informative to be part of this team and to watch the progression and trends in the science and operational methods that are being applied to this expedition. I originally became involved in the PLRP because of the use of the dual DeepWorker submersible system as an operational analog to the dual Lunar Electric Rover system that my team at NASA is developing. The really special thing about PLRP is that it’s not a simulation, its real world-class science and the methods that we use to plan the flights collect and analyze the data, and the lessons we learn are directly relevant to future space exploration. It’s also pretty cool that we are seeing things that human eyes have never seen before and in that sense it’s analogous to finding life on Mars or some other planet. The main contributions of our NASA Exploration Analogs and Mission Development team (EAMD) are to perform the operational research necessary to characterize the productivity and effectiveness of the operation and then systematically analyze the data and use the results to refine the operational methods over a multi-year period with the aim of achieving the highest level of scientific return from the human and machine assets deployed during the expedition. To this end we have developed a variety of metrics that characterize the data, and observation quality along with the operational performance and timeline data. These metrics are then correlated with the scientific merit metrics that we have developed with the PLRP team to understand the right balance between operational discipline and scientific flexibility. Is the right answer going to be totally rigid flight plans and flight rules to control every minute or the exploration dives, or complete scientific flexibility to explore whatever seems most interesting at the time? Probably neither, the optimal mix is most likely somewhere in between and this multi-year research program provides a unique opportunity to find that optimal mix here on earth so that we don’t have to learn those lesson out in space were the expense and consequences are much higher. Mike Gernhardt, ready for deployment in DeepWorker. 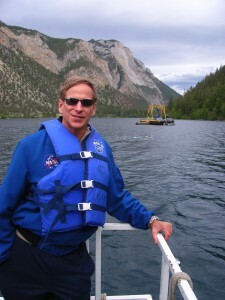 Author NASA Testing for Human Space ExplorationPosted on July 8, 2010 Categories UncategorizedTags Analogs, field test, field testing, General, Pavilion Lake Research Project (PLRP)1 Comment on Pavilion Lake and Beyond: How to Effectively Explore Other Worlds? In the name of science we have invaded cottage country. The quiet cabins along Pavilion Lake have every bed filled, and there’s a tractor-trailer in the parking lot with NASA painted on it. Instead of fishing boats we have floating science platforms, torpedo-shaped robots, and 1-person submarines. My roommate’s alarm clock is set to Stayin’ Alive by the Bee Gees. It seems a brutal sentiment at 06:45. My bunkbed mattress creaks so loudly that I only roll over when I really have to. Breakfast is a hubbub of voices, 50 scientists and researchers from all over, discussing Cheerio flavours and side-scanning sonar. Many small fans cooling too many laptops creates a steady low hum in every room. The technician’s voice is calm and steady as he reads me the submarine pre-launch checklist. The thrusters on my submarine whir and whine, like a sputtering dentist’s drill. 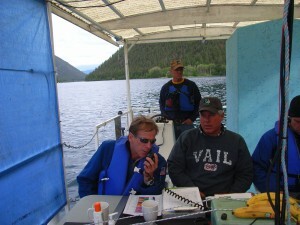 Radio voices are too loud and urgent to be natural at the bottom of the lake. My own voice sounds alien down there. The loons calling on the lake are haunting and perfect, and will reclaim the mountain silence as soon as we are gone. Viruses are Earth’s smallest inhabitants, but they are also her most abundant. Scientists estimate that the Earth houses about 10^30 viruses compared with just 6^9 (six billion) humans. A typical teaspoon-full of seawater (or Pavilion Lake water) contains between 10,000 and 100,000 viruses! If you all lined up all the viruses on Earth end to end, they would stretch for 10 million light years. Fortunately for us, the overwhelming majority of viruses are predators of micro-organisms, like bacteria and single-celled algae, and can not infect humans. Transmission electron micrograph of viruses and bacteria. 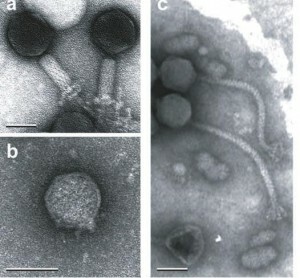 A, b, and c depict myoviruses, podoviruses, and siphoviruses respectively. Courtesy of Suttle, 2005. Viruses are tiny packets of nucleic acid wrapped in protein shell. They are reliant upon a host cell for their replication and gene expression and are as diverse structurally and genetically as they are abundant. Viruses vary in size from 20 to 600 nanometers in diameter and display a variety of shapes from thin filaments to round blobs to tiny lunar landing ships. Unique among all other life forms, viral genomes can be composed of single or doubled-stranded DNA or RNA. Viral genomes are an incredible source of genetic diversity. Between 60-90% of viral genes are new to science. In other words, these genes have no similarity to bacterial or eukaryotic genes that we have already investigated. Surprisingly, viruses are an essential part of healthy ecosystems. 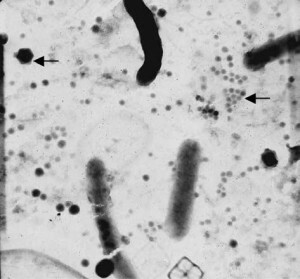 Every day they infect and kill about 20% of the micro-organsims in the ocean, impacting microbial community structure and function as well as releasing nutrients for surviving bacteria to feast upon. Viruses can also move genes between host cells via the process of transduction, making them agents of genetic evolution. The arrows point to viruses. Courtesy of Weinbauer, 2004. At Pavilion Lake, we are sampling microbialites (Fig. 2 & 3) and filtering large volumes of water (100 liters) to discover if and how viral diversity varies with depth and microbialite morphology. This year we are also working on new project, MARSLIFE, aimed at detecting nucleic acids in micro-volumes of samples (0.25 grams) while in the field from both microbialites and water samples. This directly mirrors how we might search for life on Mars – by looking for DNA in minute amounts of rock or ice. Because viruses likely evolved on the early Earth, studying the viruses of Pavilion Lake provides insight into what life in ancient microbialites and shallow seas might have been like. In the process, we gain a better understanding of not only our planet, but also what other bizarre and unique organisms the universe might be hiding. 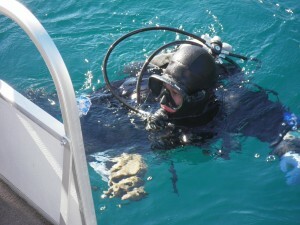 Diver bringing a microbialite collected from a depth of 85ft to the surface of Pavilion Lake. Jan Finke filtering and concentrating viruses from Pavilion Lake water.